The Killers first foray into the world of live records delivers surprisingly great results. This set includes both an audio CD as well as a DVD, the latter of which proves to be the most essential part of the package. The audience is energetic and enthusiastically embraces the Las Vegas band; this energy from both the audience and the band is best appreciated on the DVD half of the package. While hits like Somebody Told Me, When You Were Young and Mr Brightside all deliver exactly what you would expect to hear from the group, it is songs like Human, Losing Touch and This Is Your Life that benefit from the live treatment the most and help to solidify their growing reputation as a must-see live band. 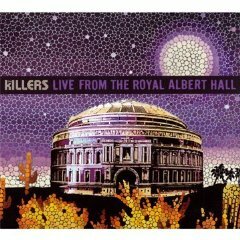 Live From The Royal Albert Hall will definitely have me revisiting The Killers studio records for another listen.